Companies looking for expansion of operations overseas (especially Europe, CIS, Eurasian Economic Union, and Iran) will substantially decrease their costs while ensuring the highest quality by locating the production facilities in Armenia. This is possible thanks to Armenia’s skilled workforce, tariff free or limited tariff international trade agreements, low tax rates (ranked 17th place out of 227 countries), the low cost of running a business, high living standards, and favorable environment to do business. 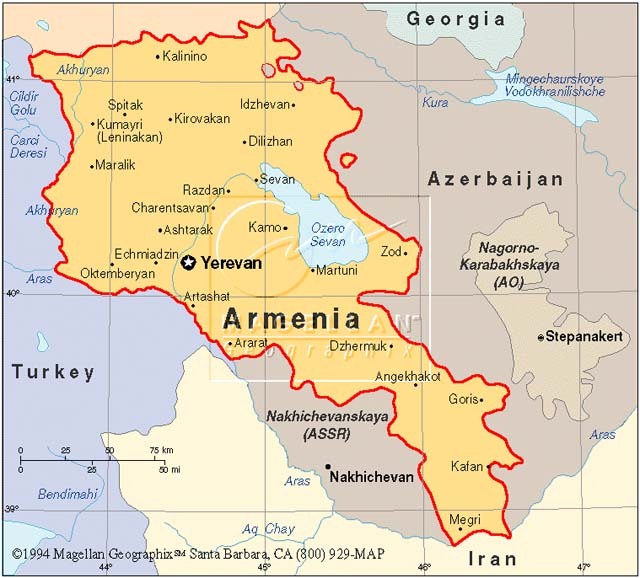 Armenia offers global investors access to major markets via its membership in the Eurasian Economic Union (EEU), free trade agreements with other CIS countries, preferential trade agreements with the European Union (EU), USA, Canada, Japan, Switzerland and Norway, and its proximity to Iran and the Middle East. The EU, EEU and Iran represent a market of over 800 million consumers. Armenia’s economy has undergone a profound transformation since it’s independence. Sustained growth, ambitious reforms, as well as inflows of capital and remittances have created a market-oriented environment. However, the global financial crisis impacted significantly the market of the country. The World Bank Group’s Country Partnership Strategy (CPS) for 2014-2017 is focusing on the most binding constraints of private sector that lead to sustainable growth through strengthening competitiveness and job creation. Simultaneously, the strategy aims at consolidating the impact of social services. The World Bank’s impact in Armenia has been felt across many sectors including roads, energy, agriculture, education, health, irrigation, rural development, public administration, and judiciary. On December 10, 2014 Armenia signed an agreement for joining the Eurasian Economic Union, resulting in: access of Armenian products to the market of 182 million people, duty free import of raw materials from EEU member states, absence of necessary customs document processing among EEU member countries, absence of non-tariff measures such as trading and technical barriers among EEU member countries, and favorable import duties for 750 product items. 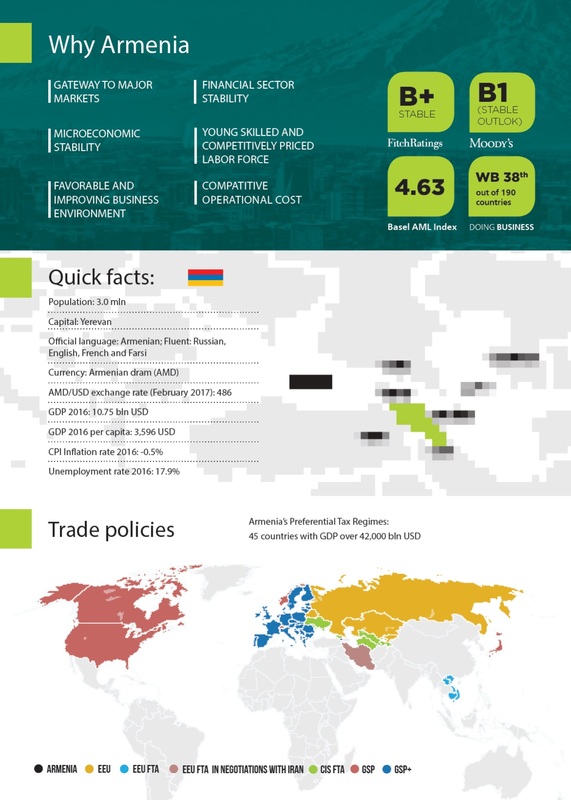 As part of free trade agreements with the majority of CIS countries, Armenia reaches a market of 250 million people. Armenia is one of very few countries that has the opportunity to access the improved regime of Generalized Scheme of Preferences (GSP+) with the countries of the EU. Armenia can trade under GSP+ on a unilateral basis that enables exporting over seven thousand items of products into EU countries under zero or reduced tariff rates. Armenia also enjoys Generalized Scheme of Preferences (GSP) trade regime with USA, Canada, Japan, Switzerland and Norway. ber since 2003 which also opens up many possibilities to extend trade relations in areas where the country is less active. The trend in trade has certainly been a positive one as Armenia enthusiastically seeks to build more new trade agreements with each passing year. The Armenian economy has demonstrated impressive growth and has had a stable macroeconomic environment over many years. The diversity of export destinations also protects Armenia’s economy from outside demand shocks. For example, Armenia’s growth rate has remained strong and steady despite a contracting Russian economy by offsetting a drop in Russian demand with increased exports to a large number of other trading partners. Armenia’s lack of dependence on oil has made its economy more dynamic, diverse, and adaptable. Therefore, it is far less exposed to isolated demand shocks, falling commodity prices, and economic contractions in major export destinations. The workforce in Armenia is highly educated, skilled with a rich tradition of craftsmanship in many specialized sectors, with the success of Armenian companies involved in information technology, life sciences, high-end textiles and garments and jewelry, being evidence of such skill and tradition. Armenia benefits from the presence of multiple international universities such as the American University of Armenia and the British School of Business Armenia. The presence of such prestigious institutions creates a valuable domestic research presence as well as a continuous supply of internationally capable employees. The labor force is well educated, particularly those involved in the health, science, technology, engineering and IT sectors. Over 99% of Armenia’s population is literate. Enrollment in secondary school is over 90 percent, and enrollment in senior school is about 85 percent. There are many areas where Armenia’s storied history and cultural traditions lend an advantage to its labor force. For example, there is a high standard for craftsmanship in luxury carpets that is translated into a world class expertise in textile production in general. Jewelry and Diamond processing are also areas where Armenians leverage their historical traditions to offer some of the highest quality skilled labor on the globe. Finally, Armenian wine and brandy are legendary products that have been produced in the country for millennia, reflecting a most favorable environment for agricultural activity due to the country high frequency of sunny days and excellent land and water resources. 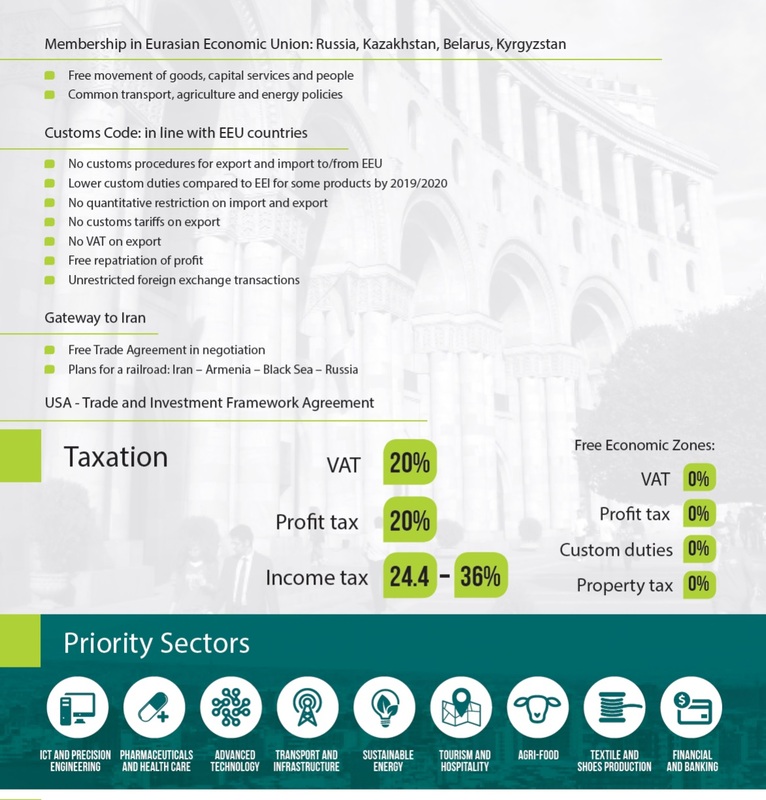 Armenia offers special incentive schemes for investors, specifically for IT companies and start ups, as well as border regions and large exporters.